Illustrations note 25 Tables, black and white; XVIII, 386 p.
The BMJ said of the first edition of Evaluation Methods in Biomedical Informatics: "A landmark book, which should have a place of honour in the library of anyone seeking a deeper understanding of clinical informatics in general and evaluation in particular." Since the release of the first edition in 1996, it has become an indispensable course textbook and resource to medical informaticians, students of informatics, healthcare administrators, and health services researchers. After four reprints prompted by continuing sales, this new edition incorporates heavily updated and revised material to reflect the changing demands on today's health information technology professional. As information technology takes on an increasingly central role in health care and biomedical research, successful and reliable methods for evaluation become more and more imperative. 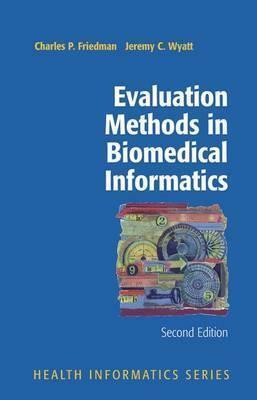 Evaluation Methods in Biomedical Informatics, Second Edition, is the best resource available to support discussion, development, and implementation of evaluation procedures in these settings. A Web site accompanies the book and includes further material, clickable links to all Web sites cited in the book, additional links, case studies, and other tools to support evaluators, as well as updates to the book's content. critique studies of requirements, usability, impact or side effects of information systems in health and laboratory settings will find this book invaluable. It is written to be directly usable as both a textbook for formal courses and a reference book for researchers and practitioners.